Below we will link to Maps for all of NW Ireland as time permits (please look to other pages for links to the other maps (Old such as Ordinance Maps, and new ones, and other items such as Satellite images and Hi-Res Sat images). Give the below Maps time to load …..
Below is what is commonly called the Petty or the Down Survey as the Maps were made by William E. Petty (a English scientist ) in 1685. It has been reproduced and some closer scale maps are common throughout the area even today! For more information see the Cromwell Conquest of Ireland. Sligo was the ancestral territory of a branch of the O’Connors, called O’Connor Sligo. Other Gaelic families associated with the county include O’Dowd, O’Hara, O’Hart, McDonagh, Mac Firbis, and O’Colman. The site of the town of Sligo has been of strategic importance since ancient times as all traffic on the coastal route between South and North had to ford the river here. A fortress which guarded this ford was plundered by Norse pirates as early as A.D. 807. After the Norman invasion of Connacht in 1235, Sligo was granted to Maurice Fitzgerald who effectively founded Sligo town by building a castle there in 1245 and making it his residence. The Taaffe family was among the Norman families who settled in the county. Further settlers were brought into the county at various periods, including weavers from the north of Ireland brought in by Lord Shelbourne in 1749. As the native Irish and Norman population were predominantly Catholic, the Scottish usually Presbyterian, and the English of the Protestant faith, the proportions of these religions among the population can, in very general terms, be used to estimate the origins of the inhabitants of the county. When religious affiliation was first determined in the census of 1861, the respective proportions of Catholic, Presbyterian, and Protestant in Sligo were 90, 8, and 1 percent. Apart from the weaving industry and some mining operations, Sligo is basically an agricultural county. The town of Sligo was an important port in the eighteenth and nineteenth centuries, particularly as the River Erne and its lake systems facilitated inland trading and transport. It was also an important port of emigration. The peak of population was reached in 1841 at 181,000. The Great Famine of 1845-47 badly affected the county and the population had dropped by 52,000 in ten years, including some 20,000 deaths. By 1901 the population had fallen to 84,000 . By 1911 currently 56,000. Sligo is an English language corruption of the Irish name Sligeach, meaning “abounding in shells” or “shelly place”. It refers to the abundance of shellfish found in the river and its estuary, and from the extensive shell middens in the vicinity. The river now known as the Garavogue (Irish: An Gharbhóg) meaning “little rough one” was originally called the Sligeach. It is listed as one of the seven “royal rivers” of Ireland in the 9th century AD tale The Destruction of Da Dergas Hostel. The Ordnance Survey letters of 1836 state that “cart loads of shells were found underground in many places within the town where houses now stand”. The whole area, from the river estuary at Sligo, around the coast to the river at Ballysadare Bay, is rich in marine resources which were utilised as far back as the Mesolithic period. This is an outlier of the large group of monuments at Carrowmore on the Cuil Irra peninsula on the western outskirts of the town. The area around Sligo town has one of the highest densities of prehistoric archaeological sites in Ireland. It is the only place in which all classes of Irish megalithic monuments are to be found together. Knocknarea mountain, capped by the great cairn of Miosgan Maeve, dominates the skyline to the west of the town. Cairns Hill on the southern edge of the town also has two very large stone cairns. The Norman knight Maurice Fitzgerald, the Lord Chief Justice of Ireland, is generally credited with the establishment of the medieval European-style town and port of Sligo, building Sligo Castle in 1245. The annalists refer to this Sligo as a sraidbhaile (‘street settlement’) which seems to have consisted of the castle and an attached defensive bawn. A Dominican Friary (Blackfriars) was also founded by Maurice Fitzgerald and the King of Connacht Felim mac Cathal Crobderg Ua Conchobair in 1253. This was accidentally destroyed by fire in 1414, and was subsequently rebuilt in its present form. Norman hegemony was, however, not destined to last long in Sligo. The town is unique in Ireland in that it is the only Norman-founded Irish town to have been under almost continuous native Irish control throughout the Medieval period. The Normans were halted in northwest Connacht after the battle of Credran Cille in 1257 at Ros Ceite (Rosses Point) between Godfrey O’Donnell, Lord of Tirconnell, and Maurice Fitzgerald. Both commanders were mortally wounded in single combat. This battle effectively halted Norman expansion in the northwest of Ireland. Despite numerous Anglo-Norman attempts to retake it, it became the administrative centre of the O’ Conor Sligo (O’Conchobar Sligigh) confederation of Iochtar Connacht (Lower Connacht). 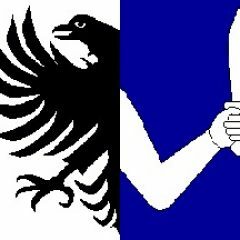 Also called Clan Aindrias, the O ‘Conors were a branch of the O’ Conchobar dynasty of Kings of Connacht. It continued to develop within the túath (Irish territory) of Cairbre Drom Cliabh. The other Irish territories subject to here were Tireragh (Tir Fhiacrach), Leyney (Lúighne), Tirerill (Tir Olliol) and Corran. Throughout this time Sligo was under the system of Fénechus (Brehon) law and was ruled by the Irish aristocratic warrior class. Through competition between these warrior clans for the lucrative port duties of Sligo the town was burned, sacked or besieged approximately 49 times during the medieval period, according to the annals of Ireland, however these raids seem to have had little effect on the development of the town as by the mid 15th century the town and port had grown in importance. It traded with Galway, Bristol, France and Spain. Amongst the earliest preserved specimens of written English in Connacht is a receipt for 20 marks, dated August 1430, paid by Saunder Lynche and Davy Botyller, to Henry Blake and Walter Blake, customers of “ye King and John Rede, controller of ye porte of Galvy and of Slego”. Sligo continued under native Irish control until the late 16th century when, during the Elizabethan conquest, Sligo was selected as the County town for the newly shired County of Sligo. An order was sent by the Elizabethan Government to Sir Nicholas Malby, Knight, willing him to establish “apt and safe” places for the keeping of the Assizes & Sessions, with walls of lime & stone, in each county of Connacht, “judging that the aptest place be in Sligo, for the County of Sligo…” The walls were never built. In 1798 a mixed force of the Limerick Militia, Essex Fencibles and local yeomanry under a Colonel Vereker were defeated at the battle of Carricknagat at Collooney by the combined Irish and French forces under General Humbert. A street in the town is named after the hero of this battle Bartholomew Teeling. The Lady Erin monument at Market Cross was erected in 1899 to mark the centenary of the 1798 Rebellion. The town suffered badly from a cholera epidemic in 1832. “At the end of that time, we were able to live in peace till the plague had abated and we could return to Sligo. There, we found the streets grass-grown and five-eighths of the population dead. We had great reason to thank God who had spared us”. The Great Famine between 1847 and 1851 caused over 30,000 people to emigrate through the port of Sligo. On the Quays, overlooking the Garavogue River, is a cast bronze memorial to the emigrants. This is one of a suite of three sculptures commissioned by the Sligo Famine Commemoration Committee to honour the victims of the Great Famine. In 1961 St. John the Baptist’s Church became a cathedral of the Diocese of Kilmore, Elphin and Ardagh after St. Mary’s Cathedral in Elphin was abandoned, being destroyed by a storm four years previously. Sligo town was heavily garrisoned by the British Army during the War of Independence. For this reason IRA activity was limited to actions such as harassment, sabotage and jailbreaks. At various times during the war prominent Republicans were held at the Sligo Gaol. The commander of IRA forces in Sligo was Liam Pilkington. Arthur Griffith spoke in April 1922 on the corner of O’ Connell St. and Grattan St. To this day it is known as Griffiths corner. Sligo railway station was blown up by Anti-Treaty forces on 10 January 1923. The Province of Connacht (was named for a People that inhabited the area called the “Connachta” which were reputed to be descended (they said or assumed) from “Con of the hundred battles”. Please be aware much of this “lore” and some is being re-examined, but for this site We will present what We know/were taught, and leave it to other sites to re-examine/confirm or deny the History or assertions (after all this Site is about Genealogy, not History), however both are intertwined. KILMACTEIGE. South Sligo History, Petty Map 1685. Kilmacteige (pronounced Kill-mac-tige, also spelled Kilmactigue) is a Parish and Townland, in the Northwest of Ireland. In 1685, Petty in the Down Survey, mapped the area (to pay for Cromwell’s War in Ireland by promising land to the creditors) which is around or near the “Slieve Gamph” or “Ox Mountains”. Kilmacteige is in the Southernmost part of County Sligo. The nearest the Village is Aclare ; the nearest Town is Swinford in Co. Mayo. 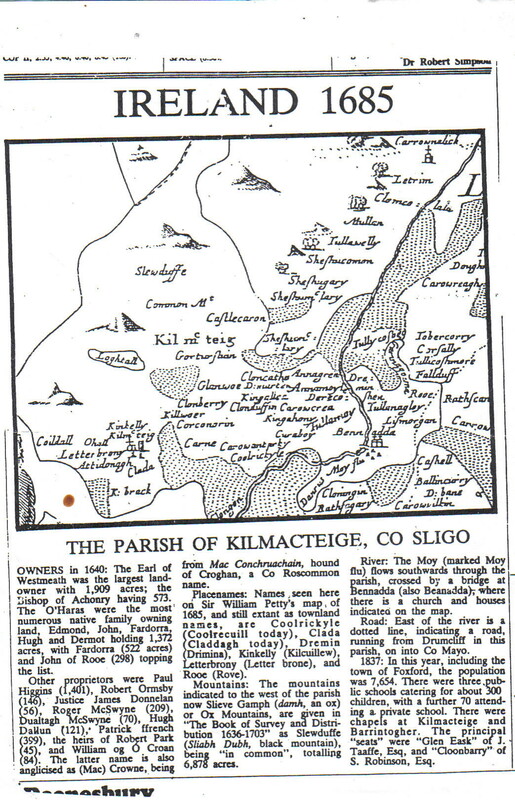 Depending on whether We are talking about the CIVIL or CHURCH PARISH it might be spelled KilmacTIGUE, or KilmacTEIGE (the last letters are emphasized to note the different spelling). The People’s of Kilmacteige (no matter how spelled) are the Best in Ireland! Ancestors go back possibly 5000 years, it is mainly a rural, farming, area. Gov. required BMD records generally started around 1845.